My kids just eat TOO MANY vegetables, how can I get them to stop? Said no parent, ever. In a perfect world, broccoli would taste like chocolate and kids would beg for just a little more cauliflower with dinner... but alas, that's not the case. Instead, parents from coast to coast spend meal after meal trying all sorts of methods of encouraging, pleading, hiding and more in order to get their offspring to consume their veggies. In fact, did you know that 9 out of 10 people in the United States do not get the proper amount of vegetables (according to The State Of The Plate report)? That means that it is far more than just kids that need the extra reminder to eat up! While my kids are actually pretty good veggie eaters, I'm still loving that Birds Eye has helped make the whole process easier by partnering with Melissa d'Arabian, celebrity chef, mom of four, and host of FoodNetwork.com's web series The Picky Eaters Project, to make a difference and help moms with the dinnertime dilemma! 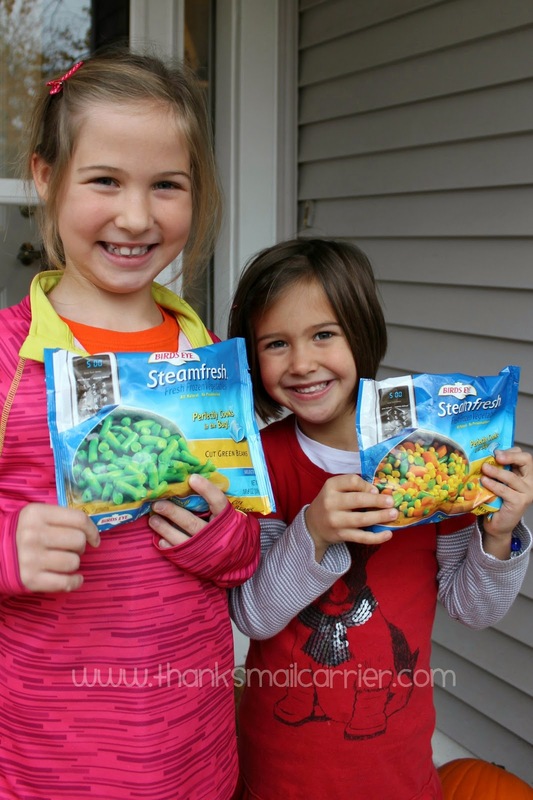 Everyone knows it can be tough to get a balanced meal on the table every day and Birds Eye frozen vegetables help by providing nutritious, tasty veggies that kids love. Together, Birds Eye and Melissa are combining their expertise in getting children to eat more veggies while promoting the Step Up To The Plate project. Step Up To The Plate is Birds Eye's long-term commitment to reshaping kids' veggie perceptions and getting children to like veggies for life and I'm all for it! I have long made vegetables an integral part of our meals and, combined with modeling how much I love them, my girls have nearly always accepted vegetables without whining or complaining. Introduce new foods slowly, pairing them on the table with familiar flavors. Mix up the vegetable types that you serve and the flavors in your recipes. Look for alternative vegetable occasions, including breakfast. Veggies aren't just for dinner! Get picky eaters excited to eat healthier foods by by involving them in the meal preparation. Fresh or frozen, it is important to incorporate veggies into every meal. I often let my kids pick the Birds Eye vegetables that they would like from the store as well as which ones they want with dinner and that has never failed to make them excited to chow down! I love the time-saving easy convenience of the Steamfresh line! You've really got to check out the full collection of videos, but I especially love this one and the way that Melissa not only gives great tips but that her recipe for Pan-Sauteed Orange Chicken with Broccoli looks quick, easy and delicious! I also really like Melissa's video on incorporating veggies in with breakfast (whether breakfast is in the morning or your family is having breakfast for dinner), as that is the meal in which we typically have the least vegetables (if any). I'm now on a mission to get these two more excited about having any one of the delicious Birds Eye veggies mixed in with our breakfast dishes! In the meantime, we've not only been including vegetables in our usual recipes and sides, but we've been trying out some of Birds Eye's suggestions as well. I let my girls be in charge of selecting which of their recipes they wanted to have for dinner and, sure enough, they were happy to dig right in to their Veggie Stuffed Pizza Pockets! These handy little pockets are filled with veggies and cheese (and can be dipped in marinara, which we found was just the right accompaniment) and my kids had a blast helping with the mixing, stuffing and folding. Even though we initially weren't sure how the flavor combination of these would turn out, they really are extremely tasty! With so many vegetable blends offered year round at affordable prices, Birds Eye makes it easy for parents everywhere to make veggies more commonplace on their table. They have something for every taste bud... plus more! Be sure to head over to BirdsEye.com to find out more about their tasty products, browse their large selection of recipes, see how to fill half the plate with veggies in fun and simple ways and much more. You can also connect with Birds Eye on Facebook, Twitter and Pinterest to continue the conversation even further. 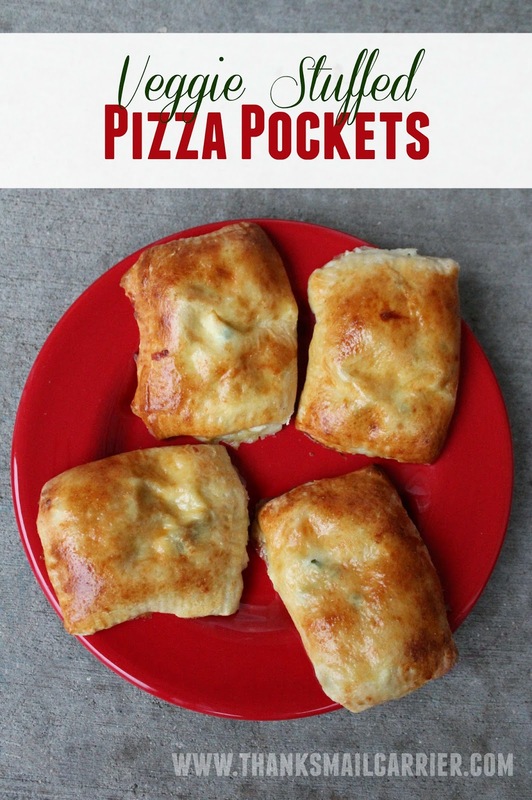 I have such trouble with getting my girls to eat their veggies but I will give those pizza pockets a try! Letting kids help pick what veggies to get and then helping to make them is a great way to get them invested in eating them. Kids (and me) like pockets of stuff and all the better with veggies inside. I LOVE veggies, so if anyone's kids won't eat these, I will! Those pockets look delicious to me. Maybe the kids will eat them if they see me having them. I can always hope. I love BirdsEye vegetables! 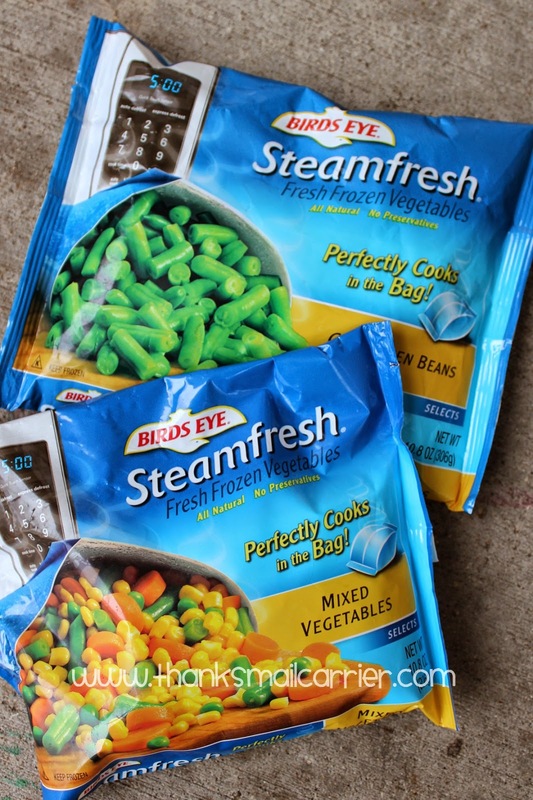 Their steamfresh bags are my absolute favorite and I love trying all the different veggie mixes they offer :) Thanks for sharing! We really like Birdseye veggies in our family and this recipe looks delicious! 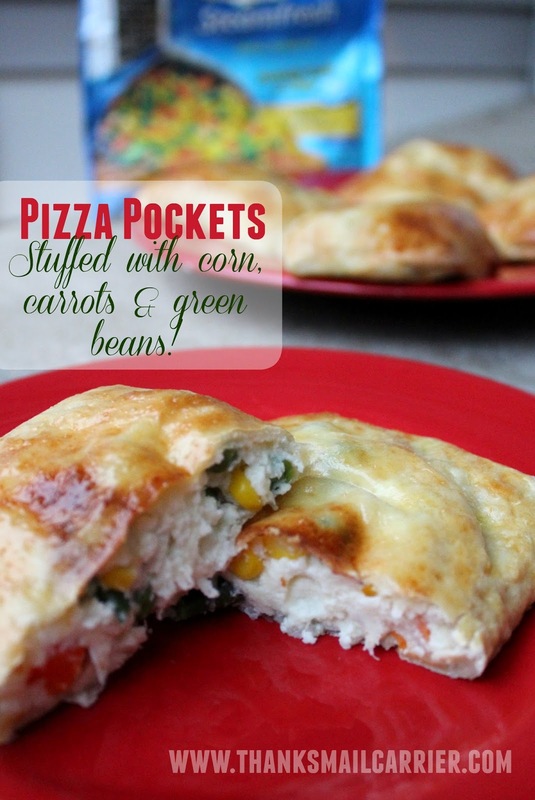 I love the Veggie Stuffed Pizza Pockets filled with veggies and cheese. My kids will love them! I know my kids would love this. I have never made these before but I bet they are good. This is healthy and creative idea!!! These sound like a great idea. Both healthier and flavorful. I'm going to try this.